After Fakarava, the Oceania Marina headed to Rangiroa in French Polynesia. Rangiroa is the largest atoll in the Tuamotu Archipelago of French Polynesia and the second largest atoll in the world. The Tuamotus are located several hundred miles northeast of Tahiti and the Society Islands. There are less than 3,000 people on the Rangiroa atoll and Avatoru is the largest village. There are more than 400 small islands, called motus, that create the lengthy narrow atoll ring around the Rangiroa lagoon. The cruise ship snorkel tour to the Aquarium Garden was too expensive. So, we headed out for a Rangiroa Shore Excursion on our own. We wanted to snorkel in Rangiroa, but we had no idea about how to that when we set foot on the Avatoru motu pier at the small village of. Luckily the local people had the solution. Rangiroa shore excursion Snorkel expeditions were approaching passengers as they arrived. The first tour was offering a one hour Aquarium Garden snorkel for $50 US. Next to them, another group was whispering that they would do the same tour for $40. Either price was less than half the cruise ship rate. We opted for the cheaper rate and our self-guided tour of Rangiroa quickly became a group snorkel tour. The “Aquarium Garden” at Motu Nui Nui was 5 minutes by boat from the tender pier. The extremely small island at Motu Nui Nui attracted all kinds of tropical fish, because the current at nearby Tiputa Pass stirs up nutrients for the marine life. The current was strong and the locals provided no instruction about avoiding the coral. Staff on the boat were not concerned at all that their passengers were getting cut badly by coral. I enjoyed the snorkeling and successfully avoided the coral, because I knew better in the first place. The current wore me out before the hour of snorkel time was up, though. After the snorkel adventure, we took a two minute walk through the shops around the pier. Then we walked a few more minutes to a gorgeous viewpoint at Tiputa Pass. From there we took a stroll back through the small houses to the calmer waters on the inside of the atoll. The picturesque Kia Ora Resort & Spa provided us with a lovely view. We lasted quite a while in the warm sunny weather, but eventually the effects of our refreshing snorkel wore off. After our stroll along the waterfront, we headed back to the ship for an air conditioned meal with a French Polynesian atoll view. Later that day we talked to a couple who had negotiated a trip to the Blue Lagoon. The lagoon is about an hour away from the tender pier by boat. They were able to swim and snorkel in the beautiful blue waters. The white sand beach was crushed coral set among coconut palm trees. 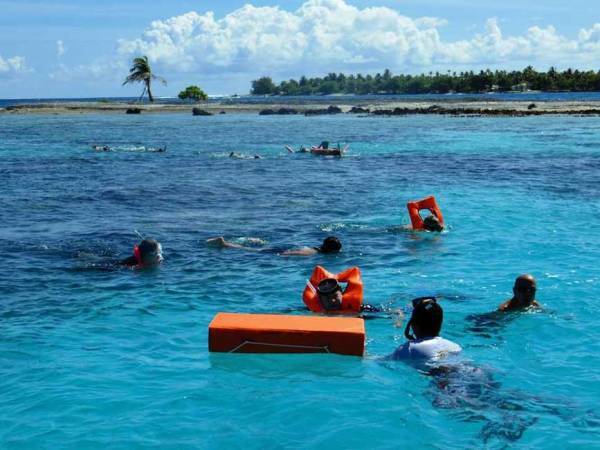 The couple said they thoroughly enjoyed their Rangiroa Shore Excursion. 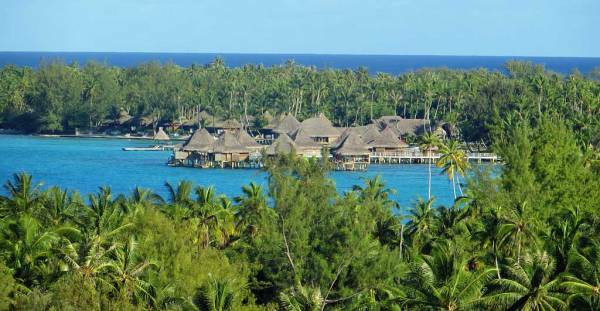 Other options for a Rangiroa Shore Excursion include a visit to a pearl farm or a glass bottomed boat ride to the Aquarium Garden. 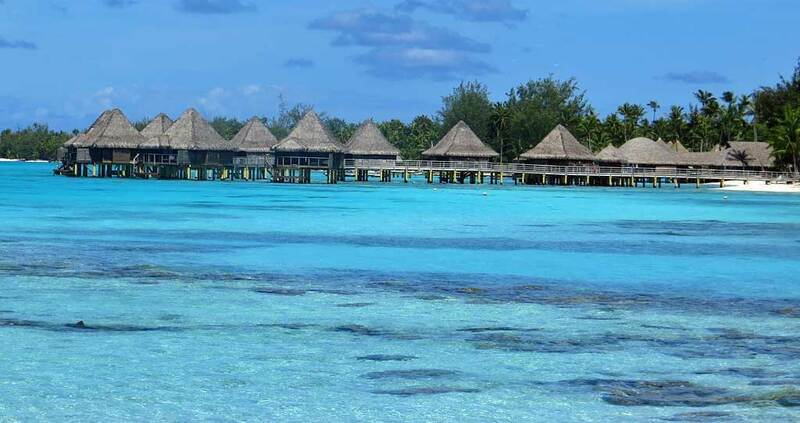 For those who don’t cruise, Air Tahiti flies to the Avatoru Airport from a number of destinations in French Polynesia, including Bora Bora, Papeete and Fakarava. Cruise ships visit Rangiroa through the extremely narrow channel at Tiputa Pass. It divides the Tiputa Motu from the Avatoru Motu. Cruise ships anchor beside either motu and tender passengers to the small piers. When cruise ships are in the lagoon, there is regular water taxi service between the tender piers across Tiputa Pass between Avatoru and Tiputa islands. It costs about $5 US to switch islands. We got the same perfect weather in Rangiroa as we did the day before in Fakarava. You can expect very little variation in temperatures throughout the year. The rainy season extends from November to April, but there are usually sunny breaks almost every day. June through October are more popular tourists months, because the days are dry and warm.